"wake up!" Sora heard his mother call from downstairs. He dragged himself out of bed and dressed in the normal Namimori uniform. He started to put on his socks when he almost thought, "Maybe it's all been a dream. Maybe I'm safe." I said, almost . A foot appeared through the doorway and kicked Sora in the face. "Ciassu" a man wearing a black suit and pompadour stood in his doorway, a chameleon perched on his hat. "Reborn! Why is it the first thing you always do when you see me is hurt me?!" Sora whined. "hurry up. It's 7:50. Your brother already left." Reborn ignored his question. Sora looked at his alarm clock, it read 7:48. "Dammit! I'm gonna be late!" Sora ran downstairs and grabbed a piece of toast and shoved it down his throat. He ran out the door before his mother could even say,"good morning." A few minutes passed and Sora wasn't even close to Namimori High. "dammit, I'm not going to make it." sora started to walk. "you will make it." reborn appeared on top of a wall. The chameleon, known as Leon, transformed into a green pistol. Reborn pointed it at Sora. As Sora fell to the ground he thought, " if I had a dying will i would be able to make it to school on time." Sora stood up, all of his clothes gone except for his boxers and an orange flame in front of his head. " I will get to school on time with my Dying Will!" He ran all the way to school as fast as a cheetah. When he arrived the fire died out and the clock wrung, 8:00. He looked around and everyone was staring at him. He heard some people mutter, " oh look there's underwear boy." " yeah he's such a perv." Sora walked to the bathroom and changed into his extra uniform. Sora walked to his first class, Math. Outside the door a boy with Silverish white hair sat in a chair. The boy gave him a look of hatred. Sora started to sweat and he walked into the classroom. "Raianosuke Sorahakai! You are late again." his teacher yelled. Sora walked to his desk ignoring the snickering coming from his classmates. The rest of the day went like that, with teachers constantly getting mad at him. Ko slept in his bed, in his uncles and aunts house. The nightmare ran on constant play back all night. The face of the darker man, the feeling of his flesh being cut open. And for some reason, his eye would not snap open. Soon enough the alarm rang and Ko jolted out of his bed with a gasp of air with his aunt standing at the door sighing. "again?" Ko nodded as he held his head and traced the scar that lined it. He then stood up and rubbed off the horrible feeling. The dead feeling lingered on his body as he walked his way to his dresser grabbing his uniform. Kos body slouched over to the shower, he cleaned himself up throughly. After his relaxing shower he gave a smile and headed down stairs as he buttoned up his shirt. He had his breakfast and headed to school. He headed down the street to his school. Soon enough, once he walked into the school yard a large gust of wind hit him. His uniform snapped around him as he turned his head with a rather blank lost expression as he saw a box in his boxers, again. Ko left his sigh at the door and slammed a smile on his face as he entered first period math class. He was slightly late but was forgiven for him good attendance all the time and high grades. Ko continued on with his other periods such as, history, music, literature, PE and then an off class. He walked down to the small room in the back of the school were he ran the music club at school, which was a good thing he was in as he usual was the one who did most of the musics for the school plays and such. He slowly started to play a soft melody on the piano over and over until he got it correct. Sora looked to the direction of the voice. It was the boy who had given him the evil eye earlier. "...fight me" said Renigan, cracking his knuckles "the mafia boss has to be powerful"
"Mafia Boss.........how do you know about that stuff? Who are you? Whadda you mean fight you?" Sora really started to get nervous he backed up against a wall. Reborn appeared in a doorway, "His name is Renigan Yamato. He is from Italy and is here to kill you. Now fight him." "What!? Kill me?!" Sora started to run away. Reborn turned to Yamato, "What are you waiting for? Kill him." "...Ok then" he said "GET BACK HERE" he yelled as he ran after Sora, drawing his gunblade. Easily catching up Sora, he swung his gunblade at Sora. Sora barely ducked under the gun blade. He back up against a wall and looked at Yamato. "Fight, No Good Sora." Reborn said and Leon changed into a green gun ajd for once Sora didn't argue about it. As sora fell to the floor he thought, i should have fought back. Now I'm going to die knowing that I'm a wussy. All of Sora's clothes melted off and a big orange flame bursted in front of his head. "Reborn! I will fightback with my Dying Will!" Sora ran at Renigan, as fast as a cheetah and he head butted him. Ko walked outside of his little club room and paused. It seemed like a fight was going on and so he walked over. One man had a gun blade, it made him pause and look upon the blade, scanning it over. His scarred eye watched,scanning and watching every little muscular movement. Ko walked in front of the before noticed a toddler. Although he walked up casually with a smile and everything like that. "Hello.....What is a toddler and boxer boy doing getting punished by a rebel?" His smile stayed and shined as he gave a laugh to hide his nervousness around the mans weapon. Sora completely ignored Ko and he dodged Renigan's shot.He hit at Renigan's hand, trying to knock the gunblade out of it. Menawhile Reborn talked to Ko, "Hello Ko Nobuyuki. Right now Sora or as you call him boxers boy, is testing to see if Renigan can join his family and i think he's passed." Reborn looked straight into Ko's eyes, "I know about you and your past, i know about your blood. So it would be fit for you to be one of Sora's guardians. 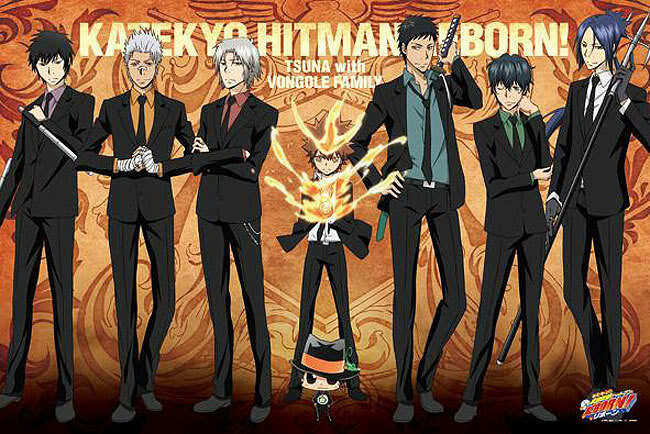 Would you like to join the Vongola." The way Reborn asked it, it wasn't a question. The fire died out in front of Sora's head, "What?! My guardian?!" Sora looked at Reborn angrily, "You set this up didn't you?" Reborn just shrugged his shoulders. Sora sighs and says, "Well i guess it might be nice to have someone strong if people are gonna try to assassinate me. Well then welcome to the family. And please, don't ever call me Master, or Sir or even Raianosuke-san. Just call me Sora." Sora smiled at Renigan and then he remembered his predicament. "Oh admmit! I'm in m underwear!" and he looked at Ko. "God! Not in front of an upper classmen!" Sora started to cry comically. "Shut up!" Reborn kicked him in teh face and he flew into a wall. Ko blinked at the man in front of him before wiping his eye clear of the daze. It turned out to be a young man. Ko froze once the man told him he knew his past. His hand traced his scar as his went through memory lane. The darker man came to mind. Kos fist clenched as he opened his eyes. "I have know Idea of what you are talking about. I accept though. As it may be a fun alternative for me. Hey, well itll be much like my concerts~." He smiled but was rather troubled by the fact that vongola showed up again in his memory. He looked at the boy and laughed before taking off his over jacket and laughing lightly. "Its ok Sora-kun. You an have my jacket for now until I can enter the changing room and grab you my shorts, although they may be a little big, but im sure if you hold them up youll be fine." Ko spoke nicely as he placed his jacket over the boys shoulder as the boy got up. Sora looked up at the upper-classman. "Thanks Ko-senpai." Sora started to think, this has been a good day. I've made some friends! And then his happy moment was ruined when Reborn said, " Oh and by the way, your family is now up to four Sora. Ko has decided to become your guardian." "What?!" Sora exclaimed. "Don't worry about it for now. Get dressed. I don't like seeing you half naked." Reborn said. "What! Your the one who shot me with the bullet that makes me lose all my clothes!" "Shut up!" Reborn hit Sora with the barrel of his gun. And Sora managed to make it to the boy's locker room without being seen. He got dressed and left the smelly room to see his brother, Demonio, Ko and Renigan. "Where's Reborn?" Sora asked, and he started to hope. "Right here." Reborn kicked him in the face. "Ow!" Sora said and he rubbed his cheek. Ko smiled before they walked off, he got his jacket back and smiled with a thank you. Then he heard something about flames and turned around with his grin. "I already learned about combustible substances in my chemistry class." Ko spoke rather clueless with a smile not getting about what to learn about flames. "What are you talking about Dai? What flames?" Sora asked incredulously. Reborn said, "He means Dying Will Flames." "Wait, like my Dying Will Mode?" Sora asked. "Yes. Your Dying Will Mode activates your hidden flame in a "hyper state" and helps your physical abilities. Dying Will Flames are the symbol of the mafia world. The Dying Will Flame is described as high-density form of energy that is refined from one's own life-force. Due the way how it resonates with one's emotions, it has been regarded as a type of battle aura. However, unlike the aura, which is a supernatural phenomenon that can only be seen by a few individuals, the Dying Will Flame is in many ways more akin to a real flame, possessing even its own destructive properties. Dying Will Flames are graded accordingly with their purity, which has a direct relationship with the strength of an individual's resolve. Among other things, this rate of purity serves to indicate how much of the special characteristics of the Flames are being drawn out. Each Flames Attribute has its own special characteristic. There are four types of Dying Will Flames- Sky, Earth, Ocean and Space. You all have dying will flames of the sky. You use rings to focus and harness Dying Will Flames. There are a total of seven different types of Sky Dying Will Flame, each shaded with a different color of the rainbow. These seven Attributes of the Sky Dying Will Flames are named after the titles of the Vongola Boss and his Guardians, and are collectively known as the "Seven Flames of the Sky". Now, while they are all referred as "flames", some Attributes actually have properties more similar to other natural elements, such as water and electricity." And Reborn continued to explain each individual flame. "So that's why there is seven guardians." Sora said. "Yes." Reborn replied, "Sora you have the Sky flame and it's Harmony. Daisuke you have the Lightning flame and it's hardening. Renigan you have the Storm flame and it's disintegration. Ko you have Rain and it's Tranquility. And Demonio you know you have Sky." "So you're now gonna look for sun, cloud and mist guardians." "Yes, now you're learning." Reborn said and he smirked. "Shut up!" Reborn kicked Sora in the face.